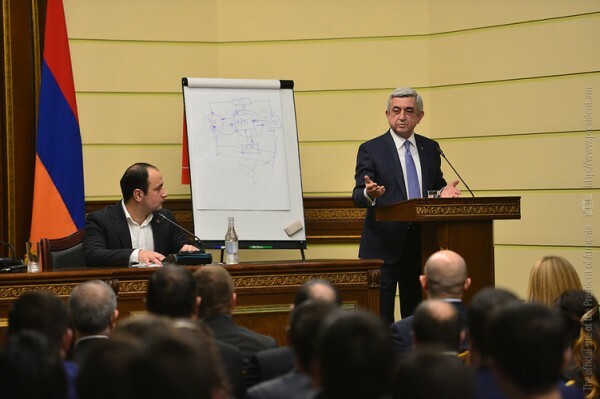 President Serzh Sargsyan was hosted tonight at the Andranik Margarian Political School of the Republican Party of Armenia where he met with the students of the School. At the first political school in Armenia, which was founded by the RPA in 2016, study over one hundred students, half of whom are non-partisan or members of other political parties. They represent various professions and occupations, ranging from students to state employees. The President of Armenia greeted the students, briefly presented his vision of a contemporary politician, sent his message and advice to the young people embarking upon the political career. Later, he answered the questions raised by the participants of the meeting and listened to their views on the topics under discussion. In his remarks, the President highlighted the importance of education, desire to learn non-stop, a certain baggage of knowledge from different areas and urged regardless of one’s profession to familiarize with the basics of law and economics, to have a good understanding of legal wording. As for lawyers, he urged them to present this wording in a comprehensible way which will be understandable for the public at large. According to the President, a person in politics should use any opportunity to take a course in economics even if a brief one since it will allow the person to adjust in a split second and make right decisions. “To engage in politics one should have a solid baggage of knowledge – political activities are impossible without it. Yes, one needs knowledge to become a politician; one has to have moral attributes to engage in politics; one needs civil courage,” underscored the President. The President of Armenia urged also to master foreign languages and at the same time to have a splendid knowledge of the Armenian language and literature. “Familiarity with our heritage is a direct link between the past, present and tomorrow - also with the future. Without that familiarity, one is not able to think in Armenian. Without a strong command of the Armenian language, one is not able to think in Armenian. However, it is one thing to think in Armenian, to express one’s self in Armenian and quite another is to think in Russian or English and express one’s self in Armenia. This is a very practical clue because ratings are very important for the politicians. And trust me, for a long time speaking in foreign languages, adherence to all that is foreign will not bring ratings. The audience feels and sees it instantly. This is important for you to understand because for a long time to come the core of our society, the driving force of our society, its locomotive will be the societal stratum which comprises teachers, our intelligentsia at large. Thus, it is necessary to have a perfect command of the Armenian language and of our heritage,” said President Sargsyan. The President viewed as not less important for the politician to make a distinction between the primary and secondary as well as political courage the lack of which, according to the President, make the presence in politics meaningless. “It is extremely important for the political figure to make a distinction between the primary and secondary because you will not find solutions or knowledge on this in the textbooks. In that frenzy (and the political field is often frantic) you should be able to separate the primary from the secondary. Unfortunately, at the moment our society is in a phase when there is really too much agitation around and to find the principal thing, the truth in that disarray will bring credit to the politician. As you see, there are not too many long-lasting politicians in our political field because they are trying engage in populism. Populism may probably be good at certain moments – three days, or five, seven, fifteen, ok – six months, but thanks God our society is able to realize very soon who is able to deliver. When one is trying all the time to move to the heavier part of the scales, it becomes a trait, and people see that too. It means one will be moving back and forth as a yo-yo, and nobody really needs a yo-yo. I would like to invite your attention to the most important thing: the politician has to have civil courage. If there is no civil courage, the engagement in politics is meaningless. Coward people, I would say, will have a political life as short as butterfly’s or a snowdrop’s. I want you, however, to get it right and understand. There are no totally fearless people in the world; only imbeciles have no fear at all. But when your anxiety turns into fear, that’s too bad. When during that anxiety, under the influence of that anxiety you change your decisions, that’s the moment you become a coward. Under no circumstance, never ever change your decisions because of pressure or fear. One of the presidents of the United States said a wonderful thing, he said to never fear concessions or negotiations, but never go to concessions or negotiations out of fear. In my opinion, Kennedy was one of the best president of the United States, and I believe his words are pretty consistent with what is going on today. For instance, we will never make concessions regarding the Nagorno Karabakh issue under pressure; we are ready for a compromise to solve the problem peacefully, without a war but no pressure – internal or external, can have any impact, otherwise for us it would be time to go packing,” stressed the President of Armenia. The President of Armenia worded his message and urges based on his own experience as well as on the examples from the international practices and assessments, spoke about difficulties and problems which appear in case the politician is lacking one of the mentioned above attributes.